Sara and Crystal are ordinary teenagers. Or so they think, until one day, their world is turned upside down when they learn that they are princesses of the magical land of Catriona. Their mothers, the rightful rulers of Catriona, are being held prisoner by Merissa, the wicked queen. Sara and Crystal must help rescue their mothers, and to do this, they have to journey to a land that does not appear on any known map. Thrown headlong into the world of vengeful, manioulative gods and deadly sorcerers, the two girls learn the art of magical warfare. But will that be enough to counter the evil unleashed by Merissa and her protector, Loki? FL Speak - Firstly, this is out and out meant for younger audiences. So people expecting a YA novel like those by Amanda Hocking or Lauren Kate, back off! Secondly, this wonderful first of a series novel is written by a 7th-grader. So to fully enjoy it, go back to your childhood. Now let the review begin. A quick grub of the story will be like this : Sara and Crystal, two bff's [also soul sisters??] lose their mothers at the same time. They didn't die, simply vanished. Ten years later, a mysterious man appears and tells them their mothers are not only alive but also held prisoners and Sara and Crystal are infact princesses of a mysterious magical land. Long story short, the magical land needs their help. Thus begins the beginning of a great adventure where they meet legends and myths come back to life. [Also Norse Gods]. One thing I have to say about the author. Being a 7th grader, she knows more about Norse Gods than I do. Anusha has done her research well. During their quest, they come across some ridiculous situations and terrifying enemies. They also realize they've magic in them. The encounter with Loki, the chase from the ice-demon (Jotuns??? ), the rescuing of Idunn, meeting little people (straight out of Gulliver's Travels, I swear) all added to fun and excitement this book is all about. Some of the scenes are hilarious. Eg. When Sara and Crystal come face to face with Loki and learns his name. Crystal blurts out, "but isn't Loki a vegetable?" bwahahahaha. These things apart, lets talk about some technical stuff that I probably shouldn't but I will. World and character building is absolutely lacking. And yes, this is no big issue when you realize the age of the author. Being 12, has led Anusha do what other authors in the YA and fantasy genre sometimes forget. Imagination. You need imagination and this young author has cauldrons and cauldrons full of it. I swear, this book is fun! Read it! Some parts in this book make you smile, some make you sad and some make you cheer for the two girls. The time when they learn about their mothers or the plight of their fathers or when they realize they're magical, those moments give you an undefinable joy of being a reader. Thankfully, and this is a very big thank you, there is no soppy romance. There are no guys in the novel. Thank the mighty LORD and hence, no sign of romance whatsoever. No undying love crap that all YA authors come up with these days [Yes, I'm talking about you Lauren Kate], no Bella-style sobbing and mooning about one soul mate. However, I am getting worried. Anusha is 12. She steps into teenage next year and *gulp* I think romance might make an entry in Book 2. Nevertheless, this has been an outstanding work by someone who is India's youngest author. And its more than understood that she'll only get better and better with every book. Will I read her second book? POSITIVELY. Should you read this book? ABSOLUTELY. 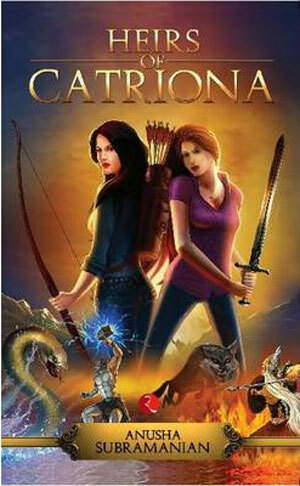 Heirs of Catriona is about love for family, trials, adventure, friendship and bravery. It is also about never losing hope and acting on your fears. It is about standing upto evil and fighting for what's right. If you've an imagination, the kid in you is still alive. Go pick this up and save the damsels. You should definitely send this review to Anusha,she could use it! Somehow it reminded me of a Barbie movie...Barbie and the Diamond Castle...yes that's it exactly! FL, lovely review. I'm just done with the book myself and my review too, and will be publishing at my blog soon :) Not a lot different from what I've written. Am now worried about reading this ! Thanks for a lovely review.. I will pass this on to Anusha. She will love this... Yes i agree with you that there are areas of improvement and this review will surely help her improve.